Pseudo-statistically speaking, the polo shirt is one of the wardrobe staples least likely to get menswear types hot under the collar. It’s a quiet background player, safe and reliable, but rarely anything to get excited about. Well, it turns out that the polo hasn’t been quietly getting along with things at all: it was transforming itself for a triumphant return. So, forget plain piques and your slogan stag do numbers, the polo shirt’s done some serious shape shifting and now can’t wait to infiltrate every aspect of your wardrobe. Again. Here are seven ways to wear a polo shirt without inducing sartorial narcolepsy. Unless you’re in some indie tribute band, the collar on your polo shirt should be open by default. Confusingly, the open collar polo shirt isn’t a styling move, it’s fashion speak for a design with no buttons at its collar at all. The beauty of this simple modification is that the subtraction of those fastening contraptions stop the polo shirt from emitting stag party vibes. What you’re left with is a hefty dose of Riviera style. Pair an open collar polo shirt with chinos and loafers and you’re living your best old money Jetsetter life. Stick one on with light wash jeans and high-tops and you’re riffing on normcore with the subtlest nod to club menswear. To keep things looking suitably sharp when wearing, look for open collar designs with a fit that’s on the fitted side, mind. The collar will sag if your polo shirt’s packing too much fabric. In the age of athleisure, the poor old suit’s taken a bit of a battering in the popularity stakes. But a polo shirt is just the thing to give tailoring a new lick of metaphorical paint. “Taken individually, the suit and polo shirt are pretty standard parts of a man’s sartorial line-up, but together they’re a classic example of how using your existing pieces in inventive ways can reap rewards,” says Higgins. Cashing in on these benefits is pretty simple. Starting with a navy, grey or black suit, simply wear a polo shirt in place of your shirt and tie. It’s hard to go wrong on colour too as a tonal polo shirt which mimics the shade of your suit will work just as easily as a contrast design. If the amount of retina-searing bright menswear currently doing the rounds is anything to go by, minimalism is dead. This means that, yes, polo shirts too have been given the anti-subtlety treatment with plenty of designs loudly and proudly announcing their presence. Those with concerns about looking like a kids TV presenter should opt for a maximum of two colours on their polo, while braver sorts should try a three colour stripe design. Then, to make sure that you’re discouraging optical acrobatics, wear an unassuming pair of light wash dad jeans and simple white trainers. In summer almost everyone’s got a little bit of added glow about them: we’re talking tans, not sticky foreheads to be clear. As a result it’s the perfect window of opportunity to lighten up your polo (and everything else) game. Start with a grey, white or stone polo shirt, then instead of instinctively grounding the look with dark trousers, try stone, cream or white chinos down below then park your feet in smart leather trainers. As a rule of thumb, the darker your complexion the lighter the tones you can pull off, so you’ll need to bear this in mind when picking a polo. If you’re paler and do want to rock a white polo teamed with light shades, a pair of sand chinos will add enough contrast to proceedings. Despite being used and abused by holidaymakers and stag parties, the polo shirt has been a menswear classic for generations. You can easily revive a bit of that mid-century appeal by recruiting a pair of pleated trousers for your cause. You’re not home and dry just yet though: this polo shirt style move needs due care keep you from twinning with your grandpa. 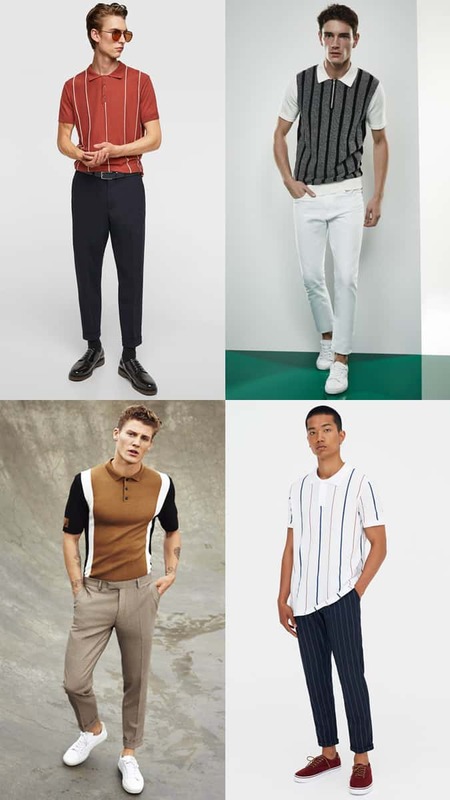 Make sure you choose pleated trousers which err on the slimmer side, go for a polo shirt with some design interest (textured, slub weave or printed) and choose trainers over smart shoes. The terry towelling polo shirt is nothing new. In fact, it’s up there with pork pie hats and braces: it’s resolutely old school. Despite this, an inexplicable dip in popularity since its heyday has made it ripe for the picking for a new generation of men. Despite essentially being a polo shirt shaped towel, the design’s got more class and pedigree than your average aristocrat. For you, that means a stupidly simple way to smarten up your act without really trying. The beauty of the terry towelling polo is that it loves simplicity. Pair a pale pink design with block colour shorts (navy or white will do) and some leather sandals and you’ll make holiday dressing look like it’s not a complete nightmare to get right. Thanks in no small part to the world’s youngest style influencer Prince George, piping (once seen exclusive on school uniforms) has re-entered the menswear vernacular and given polo shirts a much-needed adrenaline shot. Even better, piped polo shirts know how to play nice, so they’ll pair equally as easily with shorts as they will jeans and can be worn tucked or untucked as you see fit. Choose a navy or white style to riff on familiar style.